Obviously when in San Francisco, it’s a must to go and visit the arguably most famous bridge in the world, The Golden Gate Bridge. When exploring a new place, I like to see as much of it as possible and one of the best ways to get about in San Francisco is via bike. 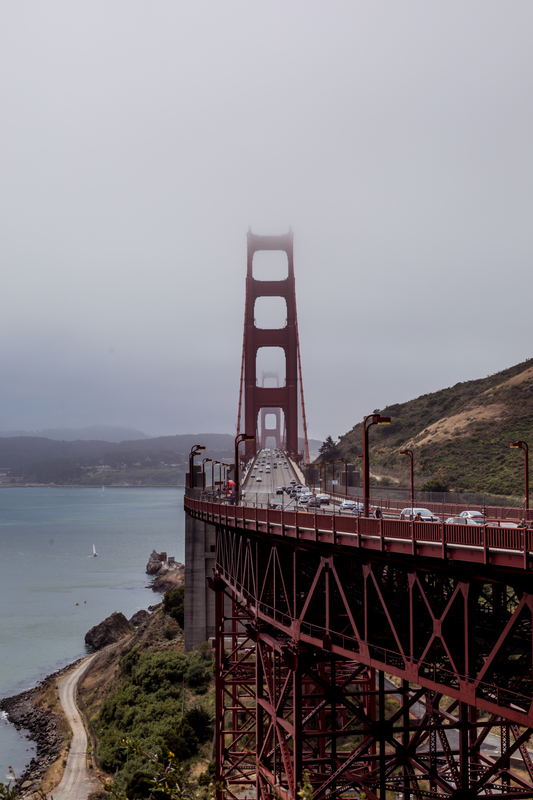 Of course it was a no brainer for Damien and I to take a bike ride over the Golden Gate Bridge, and we knew it would be a great way to see more of San Fransisco and some of the surrounding areas. As much as I enjoy wondering around a new city, I’m quite outdoorsy and so love any chance to get active and explore outside of the busy city centre. I’m so glad I came prepared with fitness gear for this trip and I’m a bit obsessed with this outfit I got from The Sports Edit. I was long overdue a sportswear update, as I’ve been wearing the same black leggings and top combo for a while now and this time wanted to opt for something a bit more fun. I always find good sportswear is worth the investment, because if you’re like me you’ll want something that’s comfortable, form-fitting and great quality that will last through constant washing and wear. 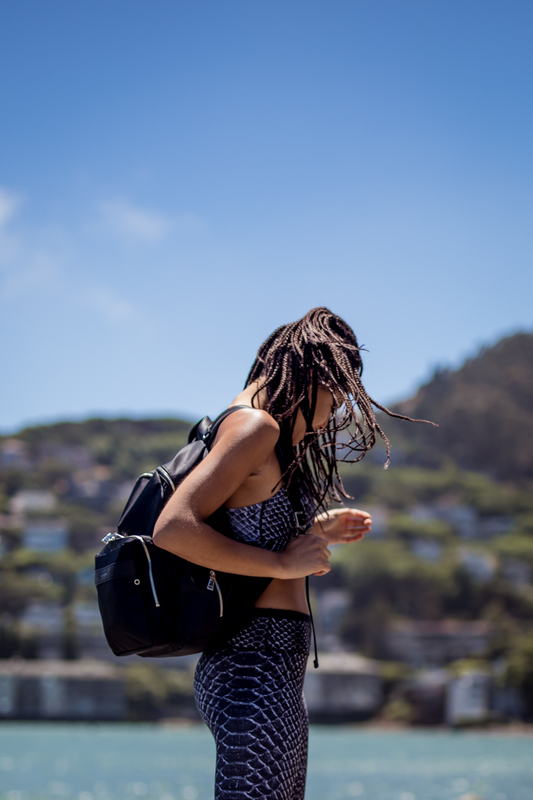 The Sports Edit stocks some of my favourite sportswear brands and their well curated selection makes it easy to pick from. I was instantly drawn to these Nimble snake print leggings and crop top. I knew these would be great for whilst away but also for back home at the gym and I’m happy to report the sports bra is both comfortable and supportive. The Sports Edit has a good selection of footwear and accessories too and I went for these Adidas running trainers and I knew they would be comfortable and also look great with the leggings and sports bra. I also went for the Fact + Fiction backpack because I was in need for a new gym/sports bag and this one was just what I was after. It actually really came in handy on my trip as it was great for travelling, as well as taking along with me on our bike ride. And how was the bike ride you may be wondering…It was great and I’d definitely recommend it if you do take a trip to San Fransisco. We took the route across the Golden Gate bridge and over to Sausalito and along the way took a slight detour up a (very) steep hill, to get some great views of the bridge and San Fransisco. I loved our little visit to Sausalito and would really like to spend more time there again as it’s such a picturesque and chilled place. Our legs were well worked by the end of the day but it was worth it and good to get active and explore just outside San Francisco. Not that you needed the workout haha you always look amazing! I must visit SAN FRAN asap, stunning shots! Ah thanks Pam. And you must, it’s such a cool place! Love the workout gear and I love San Francisco as well, I think it feels so different to most of the places in America.